A Few Kind Words From Some Of My Happy Clients. I hired Allie to help me edit and spruce up my wardrobe and she did not disappoint! We did a wardrobe audit (pretty much everything I own other than t-shirts and pajamas) in one afternoon, and then spent the better part of a day shopping — a combination of preselected items and things she found on the fly. Allie has a great eye, is respectful about budget and time on the clock, and is genuinely a pleasure to be around. In May 2017, I decided to move to a new apartment in Manhattan, and hired Allie to decorate my new apartment, and assist in the moving process. Allie was invaluable from start to finish. Allie accompanied me on my apartment search, and helped me decide on an apartment. During the three months prior to my move, Allie and I developed a close working relationship. I gave Allie various feedback and suggestions, and she would go off and research various design options and solutions, and present them to me for approval. In addition, Allie came up with numerous creative ideas and suggestions of her own. ...She custom designed an Ikea wardrobe that I am extremely pleased with, creating an attractive storage solution for my bedroom. Everyone who has seen the wardrobe in person marvels at its creativity and attractiveness. She also custom designed additional storage units for my entryway in response to my specific requests. I know Allie spent many long hours putting this together - traveling out to Brooklyn, overseeing the installation etc. - and the end result is a tribute to all her hard work. I was hesitant about hiring a personal stylist at first. I mean, shouldn’t I be able to dress myself by now? Isn’t this something all adults figure out on their own? But after 20 years of feeling insecure about how I dressed — since elementary school, basically — I decided to bite the bullet and see what a professional could do for me. I decided to view it as an investment. I chose Allie after some Googling, Yelping, and then sending out a few inquiry emails. She emailed me back immediately with a detailed explanation of her services and questions for me about what I was looking for. I decided to try her out after we had a call, and she laid out her philosophy for me. And I can say now that Allie is amazing! We had 1 wardrobe audit session (where I bagged half my wardrobe — including way too many pieces I’ve had for a decade — for Goodwill, and Allie taught me the basics of what worked on me and what didn’t), 2 shopping sessions, and 1 styling session (where she helped me put outfits together from old and new items in my wardrobe) over the course of 2 months. It’s been a little over a month since our last session, and I’ve been getting regular compliments on my outfits at work ever since! I really felt like I got a lot of bang for my buck. Allie is efficient and sticks to the essentials. She always seemed mindful of my budget and worked hard within that. I never once felt pressured or suckered into more or longer sessions (which was one of my concerns initially). Allie determined what the must-fill gaps in my wardrobe were and zeroed in on those. She visited all the stores ahead of time to pick out items for me to try when I got there. When we ended up with two items that served the same purpose, she’d say so and recommend the one I should return. She was also always mindful of the style I was striving for. I normally absolutely hate shopping, but this was the most efficient and pleasant shopping session I’ve ever had. I live in CT and recently had the experience of a lifetime. I was fortunate to meet with Allie to transform my “look”. I received more than just new clothes, it was an education. I was more than willing to go into NYC to meet with Allie. The initial information I provided helped her to identify a store appropriate for someone my age group. When I arrived, Allie had prepared numerous outfits in a private dressing area. During the process, she pointed out why certain things fit and how those things mixed and matched to put together multiple outfits. Later, we went through my current wardrobe and pointed out the items that fit correctly and how to integrate those items with the new ones purchased earlier. Working with Allie has been great. I had Allie come to my apartment to do a wardrobe audit and then subsequently had Allie meet me to help me shop for new clothes. As a busy guy who doesn’t have a great fashion sense, working with Allie helped me to put together some go to outfits that I already own, as well as to help me find some new ones. My criteria for giving testimonials is whether or not I would recommend the person to my closest personal friends. In this case the answer is absolutely. I have a career that involves television appearances and presentations and Allie was able to put together a 50+ page lookbook that I have inside my closet that helps me dress every single morning. More interesting, my wardrobe is almost 100% black and Allie was not able to work with this but developed a system to ensure that I could replicate each of the outfits without guessing what we put together. — Helped me discard the pieces that I wasn’t going to/shouldn’t wear. Allie is a tremendous asset as a Personal Stylist. She came in and gave me a closet audit identifying pieces that need to go and where my gaps are in my wardrobe. Allie was very helpful in selecting fabrics for my custom shirts. Her measurements were spot on and the shirts came out beautifully. She has a very good eye for details, right down to the buttons we selected for the shirts. Also was fantastic on personal shopping occasions going from store to store with me, helping me fill out the gaps in my wardrobe. While I was in the fitting room, she would provide me options from the floor on various outfits that go together. Overall the experience so far has been great - Allie was very professional, and met with me a week or so before the consult to discuss in general what my style is, what I want it to be, and how she can help. She also showed me some examples of lookbooks that she has put together for other clients. For the actual consult, Allie really helped me with putting together a lot of looks based on my current wardrobe, and also being honest about the pieces that don’t serve me well anymore (either are no longer in fashion, don’t work with my look, or were too worn). It was a great closet cleanse, and now when I look at what I have, I feel like I really like what I have to wear, and that I have the tools to put outfits together well. Allie also provided me some advice on key pieces I need to complete my wardrobe. She also advised me on some things I can get that work with my existing wardrobe for the upcoming season, so that I can just buy a few key things and integrate them into what I have. I’m a sleep deprived, pajama wearing, stay at home Mom... but after a closet audit/wardrobe consulting/styling with Allie... you wouldn’t know it. I learned a lot from Allie and continue to use her tips and tricks to put together outfits as quickly and easily as the pajamas I call my ‘mom uniform’. She also helped me eliminate pieces I don’t need (including those hard-to-part-with pieces that you really want to toss but can’t for some reason), find out what I am missing (which was almost everything basic) and work with what I’ve got (which I’m now rocking). Allie is pivotal in transitioning me from analyst to executive. Research proves that those who succeed at positive appearance / impressions succeed more because people view them as more relatable and reliable. I knew my new role required me to step up my authority game and knew I needed to look the part. She was phenomenal in listening to my needs, my problem areas, and budget. I dreaded editing my closet and was on day 2 when she swept in to the rescue. In less than an hour, the task was done and we had a blast. Highly recommend the In house closet cleanup service. Nothing is more valuable than the gift of more time to my day! The building a workable wardrobe piece was even more delightful. I walked away with key classic and buildable pieces and a deeper understanding of how to look put together but not high maintenance. When I hired Allie I wasn’t really sure what to expect but I knew I was in need of a change and needed help building a workable wardrobe. Based on the goals that I set with her in our initial consultation she had a creative vision. First we tackled my closet. By the end we had 4 huge bags of clothing! She enlightened me on how to wear the pieces I already own and make them more on-trend. We set a shopping list for staple pieces. When we were out shopping she would explain each piece and how I would style it for everyday or special events. Some of the things that I wasn’t so sure about on the trip I actually went back a week later to buy without her. She let me decide and never pushed me into anything, which I loved! Allie made the experience enjoyable for me with her humor and positive attitude. She continues to give me advise and tips even after our session ended. I am still able to send her pictures of things before I buy them because I know how much she cares about each and every client and how they look. I love getting compliments on my outfits. One of my new co-workers said to me the other day that she loved how funky my style was! The most overwhelming part for me was editing my closet. We got to work and it was great because Allie really helped me understand the process. She went through everything piece by piece and told me how to wear the things that we kept and why I should donate what I didn’t keep. A decade of clothing took just a few hours! I was so impressed. I love working with Allie. I tend to dress on the safe side so I told her my goal was to be a more fun version of myself. I needed great work pieces but I didn’t want them to be boring and paired with my difficult form I knew this would be a challenge. She was able to hone in on my own personal style, mix the funky pieces that I love as well as interpret the trends that I would like to wear but know wont work with my body. I told her exactly what I was looking for and she hit the nail right on the head! Almost everything she chose for me what right on the money. She would find things out and about during her everyday life and send me a pic and say “you would love this” and tell me where to get it. In just a few hours I learned so much about fashion & clothing. She showed me how to accentuate parts of my body that should be highlighted and how to draw focus away from others. 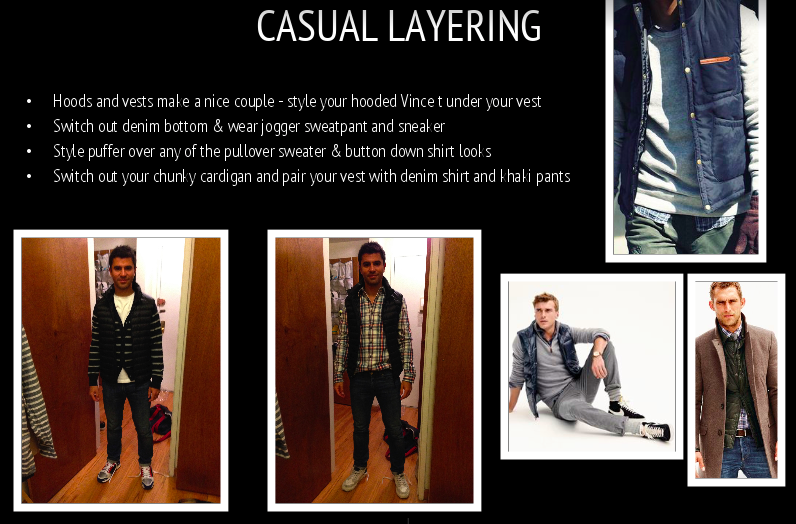 I learned how to put pieces of clothing together that I never thought about pairing. She would say “it’s all in the details Monique”. Styling Renata in her soft tops during a massive 2 day style session. Layering inspiration for Simo from our style session. Styling Katy during her wardrobe audit session. Showing Anna how she can wear the pieces she forgot about during a wardrobe audit & style session. Showing Tonya how to wear her pretty tops. Gap Assessment list from Jeremy's lookbook from our wardrobe audit session. Style-On-Demand shoppable board for a slim trouser must-have. Style-On-Demand shoppable board for her off-duty wardrobe.